The Prophet’s uncle, Al-Abbas, remained in Makkah on the Prophet’s order while the Prophet and most of the Muhajireen were in Madinah. There were others too who would give information to the Prophet about the enemies when they were planning against him. One such occasion was when the Quraish and other Arab tribes, the Jewish tribe of Ghatfan and their allies all came together and gathered under one banner to march forward and attack Madinah. Call a meeting. As soon as the Prophet heard about the army, he called a meeting with the prominent members of the Ansar and Muhajireen. Have a look at the problem logically and unemotionally and generate possible solutions. No matter how weird the idea might seem, the Prophet had made his Companions feel comfortable enough to voice it to him. Al-Sallaabee writes: ‘The Prophet always trained his Companions to feel free to express their views, even when their views were contrary to his. In fact, in the Quran, Allah Azza wa Jall tells the Prophet to consult his companions. That’s why, Salman al Farisi came up with this innovative idea of digging a trench around Madinah. It was a totally new war technique for the Arabs. Yet the Prophet realized that it was an effective technique in the given situation, and it was the most effective idea generated in the process of the shu’rah. Choose the best possible solution and put it into action. Once the Prophet decided to go with Salman’s idea, the Prophet and the Sahaba went out and chose the best location for digging the trench, and started digging. Sallaabee, Dr. ‘Ali Muhammad al-, the Noble Life of the Prophet, vol.2. Darussalam. 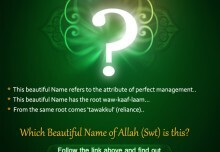 WHICH BEAUTIFUL NAME OF ALLAH (swt) IS THIS? Bismillaah . . . Just Say It!